As summer turns into fall, it is hard to ignore leaves as they change colour and drop from trees. While these changes to your neighbourhood might look pleasant, they are not doing your gutters any favours. With each passing day, or gust of wind, organic debris is being dislodged and deposited onto your roof and into your gutters and downspouts. Whether high or low, perimeter drains do not get the attention that they deserve. 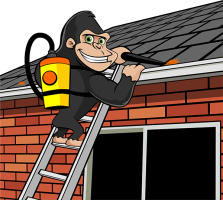 Some property owners lack the time or technique for a proper eco friendly Edmonton gutter cleaning services, but our Gorillas have both! Canadian homes and businesses are always evolving to become more comfortable and more efficient. Gutters (or an eavestrough) do their job, keeping things running smoothly, but that is only when they are in condition to do so. When your drainage system is working its best, pipes and downspouts carry water and direct it away from buildings. This drainage system not only collects water but directs it away from the edges of your property. This stops flooding of gardens, backyards and prevents water from leaking into the interior areas of your home or business. Sitting water can backup against the surface of your roof, softening and wearing away important construction materials. This means repairs, replacements to both the exterior and even interior areas. Organics break down, retaining moisture and trapping it against the materials of your roof. This creates a sort of miniature eco-system inside your gutters. A cozy, damp and covered space attracts a ton of insects as well. The only way to protect your home from the inside out from this water damage is to keep this environment clear of blockages. Fall winds dislodge organic materials from trees, leaving them to fall onto the surfaces of roofs and eventually into gutters. Leaves, sticks, needles, branches, seed pods and pine cones are the usually suspects for clogged gutters. It can be difficult to treat large and small debris, but our Gorilla have a system for it all! More than simply running a hand through gutters and grabbing at blockages, our Gorillas highly recommend the use specialty tools. By combining specially-designed vacuums and sponge techniques, drains are left spotless. In addition to clearing these gutters, our Gorillas want to keep home and property owners in the loop at all times. Before and after photos provide our customers peace of mind (while safely on the ground!). Call Gorilla Property Services today for your free estimate and exceptional cleaning experience within Edmonton and the surrounding areas.